Fine Line Homes builds in the areas of Calgary, Okotoks and Bragg Creek – all of which were severely damaged by southern Alberta’s recent devastating floods. We are saddened to see such beautiful parts of the province so torn apart, and we hope everyone can get back in their homes as quickly as possible. 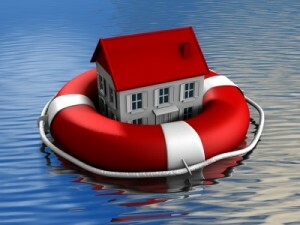 Since the event, many have been asking us if there is anything they can do to completely flood-proof their home. The June floods introduced an immense amount of water at tremendous speed at an unprecedented rate, and the flood also contained huge amounts of mud and debris. Even the very best windows can’t stop a branch being thrown at it with awesome force! Water entered homes through doors, windows and bursting sewers, and was simply impossible to stop. Building a home that is 100 per cent impervious to that kind of assault, however, damage caused by flooding can be minimalized, and there are steps you can take to protect your property. The perfect time to do it is while you’re designing your custom build Fine Line Home! Strategies include systems that resist the penetration of floodwater, plus structural adjustments that minimize the impact of flooding should it occur. Sump pump systems. A pump and sump system is a very effective way to remove water entering the lower reaches of your home from ground level. Fine Line Homes can custom build one of these systems in place, and if you don’t already have one, you can still have one installed. Sump pumps aren’t limited to restricting flood damage; they also can get rid of water in the event of an internal leak or accident affecting your hot water tank, or sewer back-up incident. One-way valves. If nearby water outlet pipes leak or burst, your property may be affected by incoming water. One-way valves stop sewage and overflow from entering your home. Special sealants. Ttreat your windows, doors, masonry, and exterior woodwork with water-resistant sealants, which will stop water from penetrating porous structures and building materials. Flood barriers. Specialized skirts and barriers, which are activated in the event of rising water levels, can help slow water tremendously. These systems are affordable, and can minimize or prevent damage to your property. Replacing perishable and sensitive materials. Swap out materials throughout your home that could be ruined by exposure to water with materials that resist moisture. Examples include replacing your carpeting with tile flooring, installing concrete floors instead of wooden chipboard or plastic, and swapping out your mineral insulation for water-resistant cell insulation. Wooden frames and skirts can also be replaced with plastic or metal alternatives. Relocating expensive equipment. Expensive equipment that would normally reside in your basement, such as a boiler, can be moved to an upstairs room that is less likely to become flooded (if space permits). Adjusting floor levels and electrical outlet locations. While it may not be feasible to completely retrofit your home in this regard, you may also want to consider raising your upstairs floors and moving your electrical outlets to higher locations on your walls. You should also make sure that your eaves are cleaned out and free of materials that might impede the flow of water through your downspouts. Also, it is always recommended that you make sure your window wells are clean and leak-free. If you are ever asked to evacuate, be sure to bring your wallet, identification, cell phone and important documents, such as your insurance information, health care information and passports. As custom home builders in Calgary and Alberta, Fine Line Homes we want you and your family to be safe above all else. We offer our customers the very best in home security and energy efficiency. If you have any questions about flood-proofing your homes, or if you’d like to learn more about our company, please contact us.